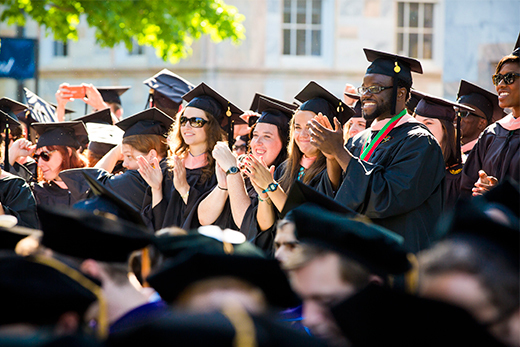 Emory's 170th Commencement, set for Monday, May 11, celebrates the diverse achievements of the Class of 2015, from academic excellence to compassionate community service. As the Class of 2015 gathers to celebrate Emory's 170th Commencement ceremony, the colorful pomp and pageantry will unfold amid a series of significant milestones, for both graduates and the university. Rooted in centuries-old tradition, graduation exercises will begin Monday, May 11, at 8 a.m., as the plaintive cry of bagpipes and the rumble of drums signal the opening processional that leads graduates, faculty, university trustees and dignitaries onto the Emory Quadrangle. This year's ceremony coincides with the celebration of "100 Years in Atlanta," an observance kicked off in February honoring Emory's charter to establish an Atlanta campus in 1915. As a result, this year's graduates represent a class that is in many ways "distinguished by paradox," says Emory President James Wagner. "For one thing, it has the unique distinction of entering during the fall semester when Emory celebrated its 175th anniversary, and graduating as Emory is celebrating its 100th anniversary," Wagner says. "That's a neat trick. It's possible, of course, because this year we are observing the centennial of Emory's replanting to Atlanta." More seriously, Wagner notes that the Class of 2015 "has demonstrated the possibility of living the paradox of humble boldness, or bold humility," demonstrating "a willingness to work boldly toward noble ideals — social justice, support of refugee communities, public health and mental health in Africa and Latin America, access to education for undocumented residents of our country, peaceful resolution in the Middle East." At the same time, "these students have demonstrated real humility in the way they extend forgiveness and compassion to those who falter in our shared work," Wagner says. In doing so, they have seen "that people differ in the way we strive to realize shared ideals," he adds. "This kind of insight requires a mature recognition of one's own weaknesses and need for help." Out of that recognition grows "the real transformation of enabling and ennobling each other and our communities," Wagner explains. "So I salute this class for enabling others while ennobling themselves as well as our community." A geographically diverse group, representing every state in the U.S. and 77 foreign countries, the Class of 2015 includes some 4,572 graduates, about half earning bachelor's degrees from Emory College of Arts and Sciences and half representing Emory's graduate and professional schools. These figures are accurate as of May 4. The ceremony represents the culmination of months of work by hundreds of university employees who each year volunteer their time to help guide visitors, set up thousands of chairs for guests, and shepherd graduates through their important day. This year's event continues Emory's quest to create a more environmentally sustainable experience for the 15,000 guests expected to gather for university-wide and individual school and college exercises. Last year, Emory undergraduates — and some professional doctoral candidates — for the first time donned graduation gowns fashioned completely from recycled water bottles, representing about 80,000 plastic bottles that were diverted from landfills, notes Michael Kloss, Emory's chief of protocol and executive director of the Office of University Events. In addition to continuing the tradition of "green" regalia, this year's ceremony features programs made of recycled paper; an increased emphasis on carpooling, both for staff and visiting families; increased mass transit campus shuttle service; water bottle refilling stations; and "a continued university-wide goal toward a zero landfill waste Commencement," Kloss says. Bins for recycling graduation gowns will be placed in the Oxford Road bookstore and the Nell Hodgson Woodruff School of Nursing. There, the recycled fabric will find a second life when it is shredded for use in carpet fibers and blankets, Kloss says. In other changes, the Office of International Student Life and the Emory Alumni Association will host a new International Graduation Recognition Ceremony this year on Friday, May 8, at 5 p.m. in the Woodruff Health Sciences Center Administration Building (WHSCAB) Auditorium. The Laney Graduate School (LGS) Master's Ceremony will for the first time be held Sunday, May 10, at 3 p.m. in the Starvine Ballroom at the Emory Conference Center Hotel, followed by a reception in the Lullwater Ballroom — a scheduling shift driven by campus construction on the Woodruff Library Plaza, the traditional site for the LGS reception, Kloss adds. Among those receiving an honorary degree during Commencement will be renowned author and human rights advocate Sir Salman Rushdie, University Distinguished Professor at Emory, who will deliver the 2015 Commencement keynote address. Considered among the greatest writers of his generation, Rushdie earned critical acclaim in 1981 when his second novel, "Midnight's Children," won the Booker Prize for Fiction. He drew worldwide attention after Iran's Ayatollah Khomeini called for his death following the publication of his book "The Satanic Verses" in 1988. As University Distinguished Professor, an appointment that concludes this spring, Rushdie spoke, taught and engaged with students and faculty on wide-ranging topics through a series of public talks, classroom lectures and university forums. In 2006, Rushdie placed his archive at Emory's Manuscript, Archives and Rare Book Library (MARBL), a decision that he has credited for making possible his 2012 memoir, "Joseph Anton," which described his years spent living under Khomeini's fatwa. In announcing Rushdie as keynote speaker, Wagner noted that the selection celebrates both Emory's literary eminence — with an acclaimed creative writing program and a robust collection of papers from a growing number of esteemed poets and writers — and "Sir Salman's own contributions to modern literature." Former Atlanta Mayor Shirley Franklin, chair of the board of directors for the Center for Civil and Human Rights, will receive an honorary doctor of laws degree. Former Emory Provost and Chancellor Billy Frye, an Emory alumnus (54G – 56 PhD) who served as interim president of the university (1993-1994) and dean of what is now the Laney Graduate School, will receive an honorary doctor of letters degree. Philanthropist and Emory benefactor R. Randall Rollins, chairman of the board of directors for Rollins, Inc., will receive an honorary doctor of humane letters degree. For more information about Commencement events, including schedules for individual school ceremonies, visit www.emory.edu/commencement. Those who can't attend are invited to view the ceremony, which will be streamed live online, at www.emory.edu/commencement/webcast.